You can't split an individual cell, but you can make it appear as if a cell has been split by merging the cells above it. Select the cells to merge. Important: When you merge multiple cells, the contents of only one cell (the upper-left cell for left-to-right languages, or the upper-right cell for right-to-left languages) appear in the merged cell. The contents of the other cells that you merge are deleted. Select the Merge & Center down arrow. You cannot split an unmerged cell. If you are looking for information about how to split the contents of an unmerged cell across multiple cells, see Distribute the contents of a cell into adjacent columns. After merging cells, you can split a merged cell into separate cells again. If you don't remember where you have merged cells, you can use the Find command to quickly locate merged cells. Merging combines two or more cells to create a new, larger cell. This is a great way to create a label that spans several columns. 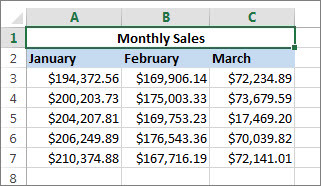 In the example here, cells A1, B1, and C1 were merged to create the label “Monthly Sales” to describe the information in rows 2 through 7. Select two or more adjacent cells you want to merge. Important: Ensure that the data you want to retain is in the upper-left cell, and keep in mind that all data in the other merged cells will be deleted. To retain any data from those other cells, simply copy it to another place in the worksheet—before you merge. On the Home tab, select Merge & Center. 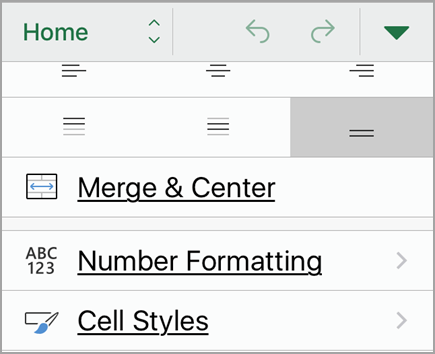 If Merge & Center is disabled, ensure that you’re not editing a cell—and the cells you want to merge aren’t formatted as an Excel table. 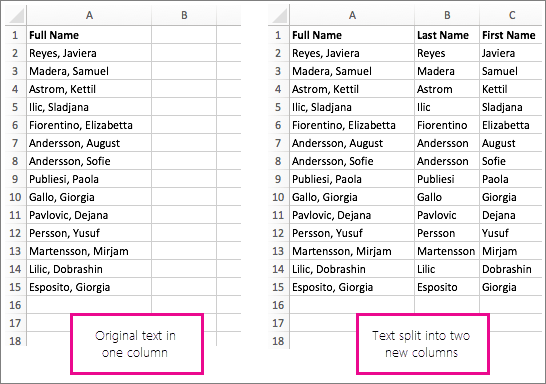 Cells formatted as a table typically display alternating shaded rows, and perhaps filter arrows on the column headings. To merge cells without centering, click the arrow next to Merge and Center, and then click Merge Across or Merge Cells. If you need to reverse a cell merge, click onto the merged cell and then choose Unmerge Cells item in the Merge & Center menu (see the figure above). You can take the text in one or more cells, and distribute it to multiple cells. This is the opposite of concatenation, in which you combine text from two or more cells into one cell. Select the cell or column that contains the text you want to split. Note: Select as many rows as you want, but no more than one column. Also, ensure that are sufficient empty columns to the right—so that none of your data is deleted. Simply add empty columns, if necessary. 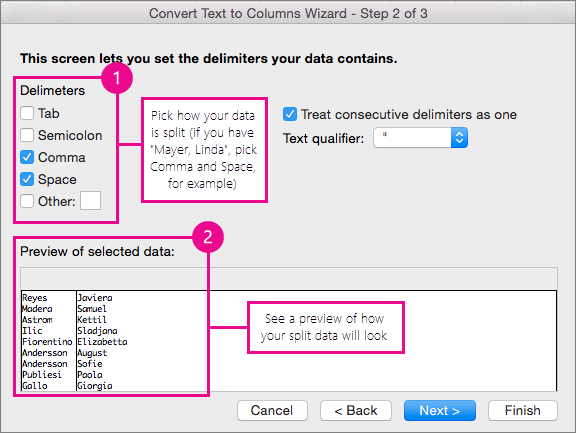 Click Data >Text to Columns, which displays the Convert Text to Columns Wizard. Check the Space box, and clear the rest of the boxes. Or, check both the Comma and Space boxes if that is how your text is split (such as "Reyes, Javiers", with a comma and space between the names). A preview of the data appears in the panel at the bottom of the popup window. Click Next and then choose the format for your new columns. 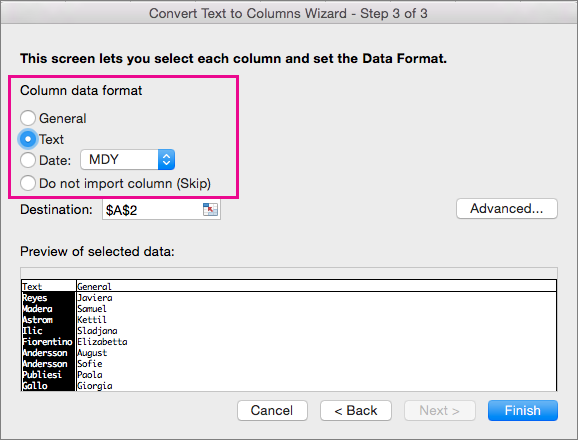 If you don't want the default format, choose a format such as Text, then click the second column of data in the Data preview window, and click the same format again. Repeat this for all of the columns in the preview window. Click the button to the right of the Destination box to collapse the popup window. Anywhere in your workbook, select the cells that you want to contain the split data. 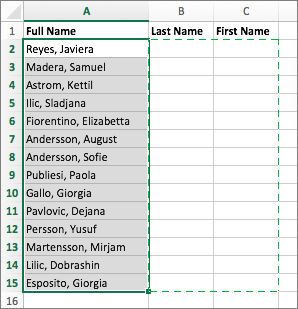 For example, if you are dividing a full name into a first name column and a last name column, select the appropriate number of cells in two adjacent columns. Click the button to expand the popup window again, and then click the Finish button. 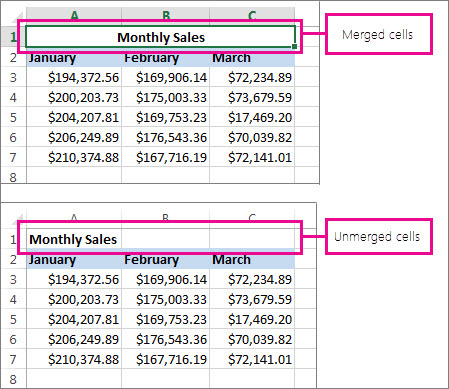 Merging combines two or more cells to create a new, larger cell. This is a great way to create a label that spans several columns. For example, here cells A1, B1, and C1 were merged to create the label “Monthly Sales” to describe the information in rows 2 through 7. Click the first cell and press Shift while you click the last cell in the range you want to merge. Important: Make sure only one of the cells in the range has data. Click Home > Merge & Center. If Merge & Center is dimmed, make sure you’re not editing a cell or the cells you want to merge aren’t inside a table. Tip: To merge cells without centering the data, click the merged cell and then click the left, center or right alignment options next to Merge & Center. If you change your mind, you can always undo the merge by clicking the merged cell and clicking Merge & Center. Click the merged cell and click Home > Merge & Center. The data in the merged cell moves to the left cell when the cells split. Drag the selection handle to select the cells that you want to merge. For example, drag the handle from cell A1 to cell C1. On your iPad, tap Merge . On your iPhone, tap the Edit icon , tap Home if it isn't already selected, and then tap Merge & Center. Important: Only the data in the upper-left cell from a range of selected cells remains in the merged cell. Excel deletes data in the other cells of the selected range. If Merge or Merge & Center is not available on the Home tab, make sure that the cells you want to merge aren’t inside a table. If you change your mind, you can always unmerge the cells. On the Home tab, tap Merge or Merge & Center again. If Merge or Merge & Center is not available on the Home tab, then the selected cell might not be a merged cell.